Ransomware programs are extremely prevalent nowadays. Due to their aggressive and malicious functionality, it is crucial to stay away from them and keep your operating system clean. One program of this classification that currently roams the web goes by the name of Gryphon Ransomware. In this article, we provide extensive information regarding the overall functionality of this malware; its processes, which eventually lead to an encryption of your data. It is easy to imagine that such functionality can have disastrous outcomes. Also, we present paramount security tips because most users end up infecting their computer with this or any other malicious piece of software due to the lack of knowledge regarding virtual security. Furthermore, we include detailed removal instruction that will allow you to get rid of Gryphon Ransomware entirely without encountering major problems. Right upon intrusion Gryphon Ransomware starts doing its dirty work. Firstly, it launches a few tasks using Command Prompt. One task is designed to delete all of your shadow copies so you would not be able to use them to restore the affected data. The other two disable automatic repair and Windows Error Recovery on startup respectively. Once all of that is done the ransomware in question will scan your entire hard drive for its contents. Right after that, the encryption takes place, which is quick and utterly silent, meaning that most users are not able to notice and stop it in time. To eliminate any chances of manual decryption malware developers employ a powerful cipher to lock each file. Every encrypted file is appended with a .gryphon extension. Fortunately, this ransomware application does not lock data essential for our operating system's functionality. Once your files are no longer accessible, you will notice a ransom note within numerous folders. It contains information about the fact that vast amount of your data has been encrypted and that without a unique key you will not be able to regain access to it. Of course, the key is held by the cyber crooks, who demand a ransom in return. You are urged to contact them via e-mail. We firmly advise you to refrain from doing so as malware developers will likely try lure money from you. Keep in mind that even if you make the payment, there are no guarantees that you will regain access to your files even if you pay up since developers of this malware are not legally bound to do that. It should be more than obvious that a complete removal of Gryphon Ransomware is essential and should not be delayed. Use the detailed instructions that we present below to terminate in the quickest way possible. It goes without saying that you must take precautionary measures to keep your computer safe and secure at all times. To avoid Gryphon Ransomware and other similar applications, you first need to start practicing safe browsing habits. This means that you must avoid various questionable third-party download websites because they are notorious for hosting bundled installers, which are frequently employed by malware developers as a means of distribution for their intrusive programs. Also, you must be aware of the fact that a lot of cyber crooks use spam e-mail campaigns to distribute their malicious applications. Therefore, make sure to avoid any e-mail attachment that is sent from unknown sources as it could turn out to be a malicious executable file. Furthermore, we always advise Internet users to learn as much as possible about any program that they wish to have active on their PC before even downloading. That is important because malware developers tend to use manipulative advertising techniques to fool unsuspecting Internet users into downloading their invasive applications. Finally, to be sure that you PC is protected at all times, you must install a reliable antimalware tool if you do not have one already. Such a tool is the most important part of your overall virtual security since it can detect and delete any virtual threat automatically. If unfortunately, your computer is already infected with Gryphon Ransomware make sure not to waste any time and execute its complete removal right away. It is important to note that you must delete every single bit of Gryphon Ransomware; otherwise, it could continue to function. In some instances, leftovers of this malware might trigger its silent restoration procedure. To avoid all of that we urge you to recheck your entire operating system for any leftovers that might be linked to Gryphon Ransomware. Such analysis of your computer should be performed right after you are done with the instructions below. If you find that a bit too complicated, be sure to scan your PC with a professional antimalware tool as it can delete anything associated with Gryphon Ransomware automatically. Then type regedit into the search box and tap Enter. Select a registry value called DECRYPTINFO and tap Delete. Click the malicious process and then select End Process. Note that the name of this process could be random. Select a malicious .exe file and tap Delete on your keyboard. 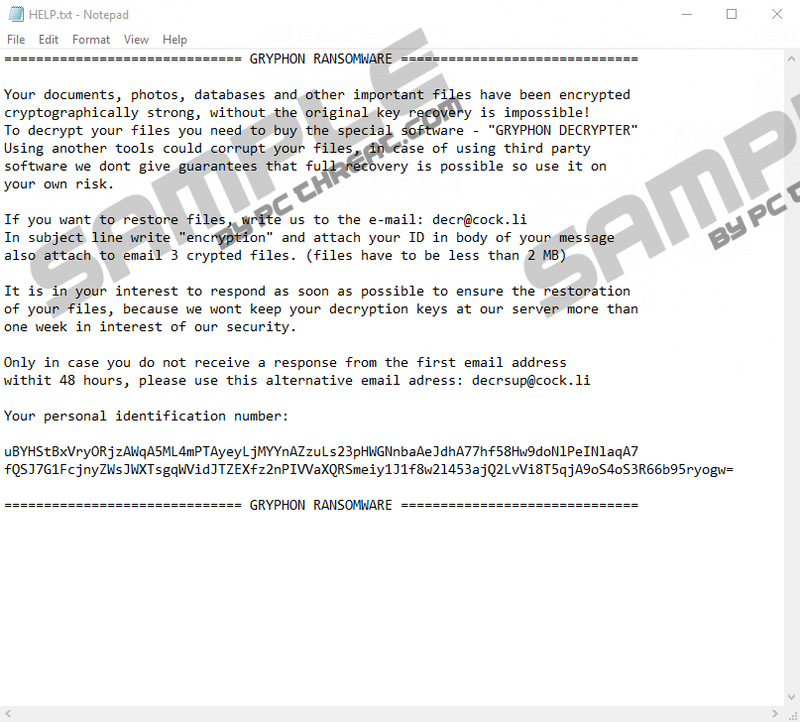 Quick & tested solution for Gryphon Ransomware removal.